Did you know that the author of the Morganville Vampires will be at Forbidden Planet in 179 Shaftesbury Avenue, London, Friday 4 May? Well, now you do. 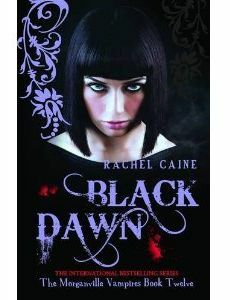 She will be signing book 12 of the Morganville Vampires series from 18 to 19. Alas, I will not even be close to London that day. Envious of everybody going! How many of you have guilty pleasures? What are they if you don’t mind me asking? Is there a movie or book that you love that you just can’t bring yourself to talk about because you know the reaction you receive won’t be a positive one? I’m not sure I can call it guilty pleasures, as I don’t feel very guilty about it, though a lot of people might think I should. Even if others would frown upon me, I don’t care. Why should I? Who is to tell me what I should or should not enjoy? To be quite frank, I find the idea of looking down on somebody for what they enjoy reading for quite snobbish, and not in a positive way. It is, of course, OK to disagree. One doesn’t have to like the same things, that would be rather boring. But telling someone that they’re stupid or whatever because they happen to like what they like, that’s is not OK. But on to what I probably should think of as “guilty pleasures”, though I simply refuse to call them so. I love vampire books. Always have done, long before vampires were “in”. Most of them, at least. My favourite by far is Bram Stoker’s Dracula, though I think it’s probably not seen as something to feel guilty about, it being a classic and all that. But I also enjoy other books. Like the Twilight series. I loved it, it was a very exciting read. (I can’t stand the films, though, they aren’t even close to being as good as the books). Another series is the Anita Blake, vampire hunter. They can be quite sappy, I guess, but they’re pure entertainment. 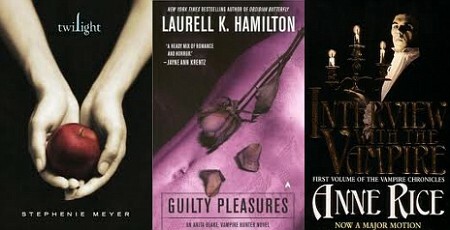 Not to mention the Vampire Chronicles by Anne Rice (though I’ve only read the first three books). I think this sort of books is like all other type of entertainment. I don’t read them for depth or to learn something. I read them to escape reality for a while, to relax and have a bit of fun. It’s not the only type or genre I read, but I like variety. So, that’s my reply to J. A. Saare’s question, I guess… Though it’s maybe not quite what she expected? 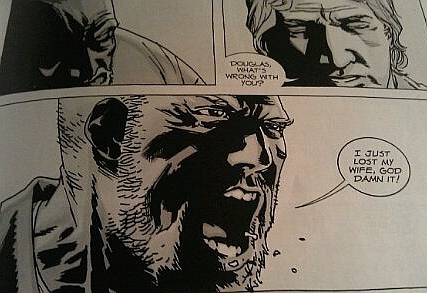 I just read volume 14 of the Walking Dead comic books by Robert Kirkman, No way out. As usual, it ends with a cliff hanger, and I will have to wait until the next volume is published. This is the sort of comic books I find easily addictive: Once I’ve started reading, I can hardly put it down. Normally, zombies aren’t really my cup of tea. However, the Walking Dead aren’t really about the zombies. Yes, the zombies, or roamers, are there, but what’s it’s really about are people. People’s reactions, their feelings, and how they cope under extreme circumstances. The artwork is brilliant too. There’s so much to read from the illustrations, they express a whole lot more than a lot of other comic books. And to be honest – I find it harder to like comics with crap artwork than the one with really good one. So, if you really like good comic books, I highly recommend the Walking Dead: It’s one of the best comics written today, in my opinion. Little Star is written by the very same author who is known from the book, and the film, Let the Right One In. I have read the book in its original language, Swedish, Lilla stjärna, which was released in 2010. The English version is due to be released 29 September 2011. Little Star starts with the former pop singer Lennart Cederström, who one day finds something in the woods he not at all expected to: Half buried, in a plastic bag, a baby girl. Lennart gives her the kiss of life, and to his surprise, her first cry is a pure, musical note. He takes the baby back to his wife, and persuades her that they should keep this remarkable child. They hide her in a room in the cellar, and keep her secret from the outside world. The girl turns out to be a strange and disturbed. When she reaches puberty, a terrifying scene sees her kill both her parents. Her adopted brother, Jeremy, takes care of her, but she is still a scared and lonely girl. Not far from Stockholm, another lonely and strange girl lives an unhappy life. Bullied by her fellow school mates, she finds comfort in poetry, trolling the Internet and learning about wolves. After a while, the two girls get in touch, and forms a special and scary friendship. They form a powerful bond and soon they do things most people wouldn’t even dream of doing. Yet again Linqvist has managed to create a chilling story. It is at times grotesque, and is not for the faint hearted. Since I read it in Swedish, I don’t know how the translation will turn out, but I found it to be well written. At times he used some slang, but in the setting it was used, it worked very well. There were parts of the books I almost felt like the need to turn away, as it wasn’t pretty, but I kept on reading. It gripped me from the very beginning, and I am already looking forward to read another book written by John Ajvide Lindqvist.